Twin theatre majors Claire and Joy Flatz are identical in appearance, but their interests, personalities and individual contributions to Grand Canyon University’s theatre program are distinctive. 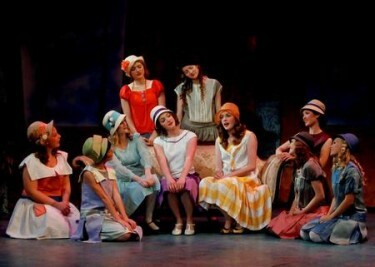 The 22-year-old seniors burst onto the College of Fine Arts and Production scene by playing the lead roles in the “The Boy Friend” as freshmen and have performed in 23 combined productions, often as leading ladies. Their costumes might as well hang from the ceiling of GCU’s Ethington Theatre, like retired jerseys in a sports arena, to commemorate their dazzling performances over four years. 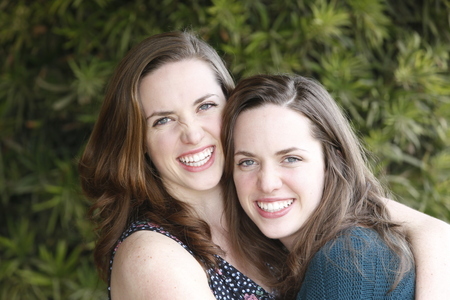 Graduating seniors Joy (left) and Claire Flatz learned to be confident, strong performers during their four years in the College of Fine Arts and Production. The freedom to perform as freshmen allowed them to find their individual strengths in film and theatre. “There is inherently a safety net that comes with performing at college and failing, which has allowed us to grow,” Joy said. Their impressive resumés extend beyond Ethington. Claire, who performed in fewer GCU productions to seek professional theatre roles, was cast in Phoenix Theatre’s “Mary Poppins” in 2014 and this year’s “Anything Goes” and was the lead in “Footloose” at Christian Community and Youth Theater in Portland, Ore.
Theatre major Joshua Vanderpoel might know the twins better than anyone in Ethington. The 21-year-old senior has performed in 11 theatre productions, including 10 with the Flatzes, and said their work ethic inspires COFAP students. “Separately, they have done almost more than the entire program combined in terms of performing at Ethington and on a national stage, but when you put them together, they leave everyone else in the dust,” Vanderpoel said. Student performers like the Flatzes have helped elevate GCU’s profile among collegiate theatres in Arizona. Claude Pensis, dean of COFAP, assistant dean Bill Symington and theatre instructor Michael Kary deserve the most credit, but students have paved the way. Unlike many universities, which often cast graduate students in lead roles, GCU underclassmen receive the opportunity in their first year. Casting newcomers has been inevitable for a program that was reinstated just five years ago after a four-year closure. But it has resurged with more than 25 productions since 2010. Pensis designed the program to prepare students for professional work as upperclassmen. With faculty guidance, students also have created additional opportunities for Ethington’s growing talent pool, such as a student improvisational comedy team and the Canyon Night Live sketch-comedy show. Other students have helped GCU’s Second Series of smaller, off-Ethington shows, where all aspects of production are handled by students. Learn more about these productions in the above video. They are earning professional work, too. Senior Ryan Usher was in a national cable commercial, and Vanderpoel acted in a national PetSmart commercial. Senior William Wyss directed and performed at Phoenix Theatre, while junior Kelsey Hillman was a stage manager at Valley Youth Theatre. Pensis credits Ethington’s rapid maturity to the leadership of the program’s 65 seniors, COFAP’s second graduating class since 2010. “Claire and Joy and other seniors are, to an extent, pioneers of our success,” Pensis said. “Our upperclassmen have taken it upon themselves to make the productions the best they can be, and the twins really have spearheaded that. The twins began singing and dancing as 3-year-olds in Ridgefield, Wash. They started acting in high school and made a very mature decision as sophomores. “Before we got an agent, we sat down together and decided that if we are going to compete for roles, we have to be each other’s biggest fan and cheerleader,” Joy said. They often audition back-to-back to support each other and stand out among the competition. They usually get grouped as “the twins,” with one cast over the other, but if they’re going to be each other’s competition, they’d also prefer to be the other’s support. As juniors, their pact was tested during auditions for “Into the Woods.” Both sisters auditioned for the role of Cinderella, and Joy was chosen while Claire was cast as the baker’s wife. Rita Flatz, the twins’ mother, said Claire was heartbroken by the casting but supported Joy. Rita and her husband, Russ, a pilot, fly to Phoenix to watch their daughters’ productions. Rita has never thought either daughter has been miscast. In April, the twins will graduate and plan to go their separate ways for the first time. Joy hopes to find commercial and film work, while Claire plans to join a national theatre company. 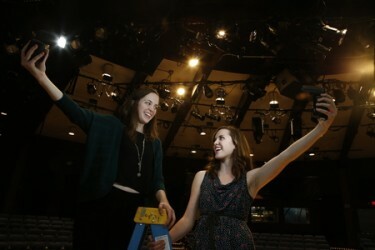 Claire (left) and Joy graduated in April, leaving the Ethington Theatre spotlight. They credit GCU’s professors for their ability to graduate and find professional work. Their legacies as top Ethington performers will live on, but Claire and Joy are most thankful for the training they’ve received as students. “Without the experience from shows and everything we’ve learned from our professors, I don’t think we’d have the confidence we have graduating and believing we can find work,” Claire said. Pensis said moving on from the twins will be tough, but they have left an impact on future generations. I’m so happy for the Flatz twins. I met them my freshman year of college and they are definitely amazing people. I miss them greatly. They are definitely representing COFAP at their finest.